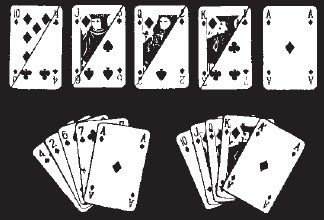 Effect: Five cards change into a Royal Flush. Secret: Take the Ten, Jack, Queen and King of one suit and cut them in half diagonally. One half is glued on to one of four other cards of any value and suit. Add an Ace to the group and fan out the cards. It looks like five ordinary cards. Lift the cards so the backs are towards the audience. Take off the Ace and show it, as you secretly turn the other cards end for end. Replace the Ace and then let everyone see the faces. They have changed into a Royal Flush.